TEHRAN, Iran, August 12, 2012 (ENS) – Two severe earthquakes of magnitudes over 6.0 devastated villages in northwestern Iran on Saturday, killing at least 300 people and injuring 2,000 others. A 6.2-magnitude quake, with a depth of 10 kilometers, hit the village of Ahar in East Azarbaijan Province at 4:53 pm local time on Saturday. Nearly an hour later a 6.0 magnitude temblor, also at a depth of 10 km, struck the nearby village of Varzaqan, according to the Iranian Seismological Center. An estimated 17,000 people are in need of assistance, with survivors devastated by the ruin of their homes and shops. At least 100 villages across the region have been affected – 12 villages in the Varzaqan area have been totally destroyed. The Iranian Seismological Center reports 24 aftershocks followed the initial earthquakes. The National Disaster Management Organization and the Iranian Red Crescent Society immediately deployed relief and search and rescue teams to the area. Late Sunday government emergency officials said the rescue and relief operations in the quake-hit areas have ended, and the focus has shifted to filling the needs of the survivors. “Although identification and search for the victims have finished, the emergency squads are still in the crisis-hit areas and are providing service to the people, especially those injured in the quake,” Gholamreza Ma’soumi, head of Iran’s Emergency Center, told the Fars news agency. President Mahmoud Ahmadinejad has approved a plan to double governmental assistance to the quake-stricken people, Interior Minister Mostafa Mohammad Najjar told a meeting at the provincial Natural Disasters Headquarters on Sunday. The Iranian Red Crescent Society put up some 5,600 tents to provide emergency shelter for quake survivors. Supplies of blankets, food and other emergency items are being distributed. Ninety-two teams from 14 provincial Red Crescent branches are already working in the area with the assistance of three helicopters, 71 ambulance crews and 40 additional relief vehicles. In all, the Iranian Red Crescent Society says that more than 800 staff and volunteers are on the ground supporting the relief effort. National authorities have not declared an emergency situation and have not requested international assistance, but still, offers of help have come pouring from around the world. UN Secretary-General Ban Ki-moon on Sunday said that he was “deeply saddened by the loss of hundreds of lives” and the destruction wrought by the quakes. “The United Nations stands ready to lend its assistance to efforts to respond to humanitarian needs created by the disaster and to mobilize international support for that response,” said a spokesperson for the secretary-general said. 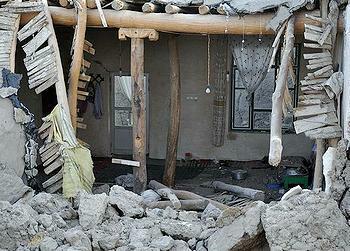 The government of Switzerland announced its readiness to send humanitarian aid. The Turkish Red Crescent Society said it is on standby to provide help as needed. Several major faults in the Earth’s crust run beneath Iran, and the country is prone to frequent destructive earthquakes.